As the global demand for green energy sources continues to rise, the advancement of fuel cell design plays a critical role in the development of viable alternatives to fossil fuel-based technologies for portable, stationary, and grid-scale power generation and storage. Unlike batteries, which generate power from internally-stored electrochemical energy, fuel cells require the continuous input of a hydrogen-based fuel source in order to produce electricity. Fuel cells possess the advantage of being able to operate indefinitely, in theory, and can be fully discharged without suffering voltage disruptions or degradation of internal components. Different types of fuel cell chemistries and configurations exist; some require a modified hydrocarbon fuel such as natural gas while others can run on pure hydrogen, but almost all generate electricity by combining hydrogen with oxygen from the air, producing water vapor and heat in the process, little to no carbon dioxide, and no harmful emissions such as NO2 that traditional petrochemical-based fuel sources produce. Applications for fuel cells include portable power units, stationary and baseload power systems, transportation, and reliable on-site distributed generation. The energy generated by fuel cells helps stabilize and supplement intermittent sources of power such as wind and solar and contributes to energy independence and security by limiting potential losses from natural or man-made disruptions to the power grid. Additionally, the heat generated by fuel cells can be utilized in combined heat and power (CHP) or cogeneration systems. Similar to the architecture of a battery, a fuel cell is composed of negative and positive electrodes separated by an ionically conductive, electrically insulating electrolyte. Chemical reactions occur at the interfaces between these component layers, resulting in the consumption of fuel, the production of either water or carbon dioxide, and the generation of an electric current. Fuel breakdown occurs at the anode, separating fuel molecules into electrodes and ions, while production of waste chemicals occurs at the cathode. Catalysts are necessary for each of these reactions; most commonly, platinum-based catalysts are used at the anode, while nickel catalysts are used at the cathode. Typical commercial fuel cells are 40-60% efficient at converting the energy stored in the fuel source to usable power in the form of electricity. However, in addition to producing electricity, fuel cells also produce heat, which in some cases can be captured for use in a cogeneration system. When waste heat is used in this way, fuel cells can achieve up to 85% fuel energy conversion efficiency. Fuel cells are largely categorized by the electrolyte chosen for their construction and the type of fuel required to run the cell. Different fuel cell designs vary in overall efficiency, operating temperature, materials costs, start-up time, sensitivity to fuel impurities, and the amount of current and power they can generate. Together, these factors determine the applications appropriate for each fuel cell design. A great number of possible fuel cell designs exist and are in various stages of development. Only the most prominent of the designs currently in use and/or development are discussed below. Solid oxide fuel cells (SOFCs) use all solid components: the most common design uses yttria stabilized zirconia as the electrolyte, nickel-ceramic composites (cermets) for anodes, and lanthanum strontium manganite for cathodes. The use of all solid materials is the key defining feature of these cells, as it allows for the development of cell designs that are incompatible with the use of liquid electrolytes. SOFCs can run on a variety of fuels, including hydrocarbons and pure hydrogen gas, and require high operating temperatures regardless of fuel type. The high temperature is necessary for the solid electrolyte to achieve high enough conductivity for optimal cell performance. High operating temperatures, typically between 800 and 1000 degrees Celsius, are the source of many of challenges the in developing SOFC technology. High temperatures cause corrosion and breakdown of cell components, and also necessitate long start-up times, limiting the utility of SOFCs for applications such as powering personal vehicles. Other issues with SOFCs that are the subject of ongoing research include a performance-reducing build-up of carbon at the nickel anode ("carbon coking" and poisoning of the anode by sulfur impurities in insufficiently refined fuels. However, these high operating temperatures also provide an advantage, as their use makes expensive platinum catalysts unnecessary for this type of cell design. Solid oxide fuel cells are currently being used or considered for use in auxilary power, electric power plant, and distributed generation applications. Polymer electrolye membrane fuel cells (PEMFCs), also known as proton exchange membrane fuel cells, are a class of fuel cells being developed for both transportation and stationary applications. They are a lower temperature fuel cell and feature a special polymer membrane which serves as the electrolyte. The chemistry which produces the energy in all PEMFC cells is hydrogen-based, but some cell designs use hydrogen directly, while others are designed for use with hydrogen-heavy organic molecules. Advantages of PEMFC fuel cells include quick startup times, low operating temperature, and the durability and design advantages inherent to using a solid rather than liquid electrolyte. However, the catalysts they require make them expensive to build and they are sensitive to fuel impurities. Additionally, the low operating temperature of PEMFCs, while advantageous in some respects, does make using their waste heat to increase overall system efficiency impractical. PEMFCs are currently mostly of interest for transportation applications, or for short-term stationary applications, such as to serve as a backup power source. Molten carbonate fuel cells (MCFCs) are very similar to solid oxide fuel cells, in that they operate at high temperatures--a necessity for their electrolyte, lithium potassium carbonate salt, to liquify and allow movement of ions--and can run on a variety of fuels. They additionally share the disadvantages and advantages which result from high operating temperatures--their startup is too slow to allow for use in most transportation applications, and they suffer from breakdown of cell components due to heat damage, but they can be used in cogeneration systems to achieve greater overall efficiencies and do not require expensive catalysts. Of all the current major fuel cell types in development, MCFCs are the least sensitive to issues with catalyst poisoning due to impure fuels. They cannot be damaged by exposure to carbon oxides, and are even capable using these compounds as fuel. Additionally, unlike SOFCs, they are not prone to carbon coking. This inherent low susceptibility to damage from impurities has lead some to suggest that it may even be possible to develop MCFCs that are capable of using fossil fuels such as coal without any prior reforming. Currently, however, these cells still exhibit some sensitivity to sulfur and particulates, which precludes their use with the dirties fuels. The greatest challenge currently facing developers of MCFCs is their low durability, and their continued development will likely require innovations in corrosion-resistant materials and cell designs. These cells are currently of greatest interest for utility-scale electricity generation, either at standard plants or as part of distributed generation systems. Alkaline fuel cells consist of two electrodes separated by a porous matrix saturated with an aqueous alkaline solution, often potassium hydroxide, which serves as the electrolyte. The alkaline electrolyte increases the rate of the reaction at the cathode, producing overall high performance, but also makes the cell highly sensitive to poisoning by carbon dioxide in either the fuel or the surrounding air. They therefore must be operated in pure oxygen or purified air, and require the integration of scrubbers in their design to prevent poisoning. These cells are most often used in aerospace applications, having served as power sources on Apollo missions and on the Space Shuttle. Phosphoric acid fuel cells (PAFCs) use a phosphoric acid-soaked silicon carbide matrix as an electrolyte. They operate at a temperature greater than PEMFCs but lower than "high temperature" fuel cells. As a consequence of this intermediate operation temperature, they can be used in combined heat and power systems, increasing their overall efficiency, and are somewhat tolerant of carbon oxides. However, unlike high-temeperature fuel cells, they do require expensive platinum catalysts. Phosphoric acid fuel cells were first developed in the mid-1960s, and have gradually improved in stability, performance, and cost. They are in wide use for small to medium scale stationary power generation applications, and have also found some use in large vehicles such as buses. Their low overall current and power make them inappropriate for utility-scale power generation. Stationary fuel cells can be used in almost any setting, from small-scale residential installations to grid-scale utilities. Fuel cells running on hydrogen are very reliable, as they lack moving parts, and are substantially cleaner than traditional power plants and generators. Cogeneration systems that allow for the use of both the electrical power and the heat produced by a fuel cell. These systems are also referred to as combined heat and power (CHP) systems, and are used to generate electricity and heat for homes, office buildings, and factories. Additionally, CHP systems can be linked to absorption chillers in order to use the waste heat to power refrigeration. Currently phosphoric acid fuel cells are found in most of the cogeneration systems in active use, but MCFCs and SOFCs can also be used in similar systems. Fuel cells are well suited to use as temporary and/or portable power systems, as they are small, lightweight, reliable, and easy to transport. Such systems are frequently used in remote locations such as oil wells or communication towers, as well as by military units and travelling civilians. 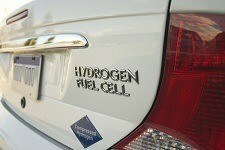 Though many fuel cell cars have been designed and showcased as prototypes, to date none are available to consumers. The primary barrier to producing fuel cell vehicles is a lack of hydrogen-fuel infrastructure and the extremely high costs of developing this infrastructure. A number of busses powered by fuel cells have been deployed by public transit agencies around the world, largely as part of pilot programs. Fuel cell-generated power is uniquely well suited to use in forklifts. Most forklifts are used indoors, and thus the emissions produced by fossil fuels precludes the use of combustion engines. However, batteries are also not ideal, as they have long recharge times and may not be able to operate for a full work shift on a single charge. Fuel cell forklifts can work for full shifts on a single tank of hydrogen, can be refuelled in minutes, and produce no emissions during use. Motorcycles, airplanes, boats, submarines have also been developed to operate using fuel cells as a power source. American Elements manufactures an extensive portfolio of mixed oxide ceramic powders, metal catalysts, industry standard nickel-cermet, ceramic pastes, and screen printable cathode inks. We work closely with the major U.S., European, Australian and Japanese efforts to develop cost-effective fuel cell electrochemistries by manufacturing materials with a high degree of process and chemistry control, allowing us to produce different formulations and surface area ranges for proprietary compositions for research and data development. American Elements maintains industrial scale production for all its fuel cell products annually producing tonnage of anode and electrolyte powders and hundreds of kilograms of cathode materials. American Elements provides customer guidance on topics such as thermal compatibility of layers, thermal cycling, thermal expansion, electrolyte densities, co-firing conditions, long-term stability, ink rheology, physical adhesion barriers, cermet microstructures, and circuit efficiency. A complete electrochemical lab allows for testing electrolyte resistivity, densities, coarsening and other parameters. Like other sources of power such as batteries or internal combustion engines, fuel cells require the use of chemicals which can be potentially dangerous if handled improperly or subjected to extreme operating conditions; maintaing the ideal operating temperature for a fuell cell stack, depending on its chemistry, not only decreases the threat of malfunction but also prevents unnecessary degradation of its component materials. Using hydrogen as a fuel emits little to no harmful byproducts, unlike hydrocarbon-based fuels like gasoline. Pure hydrogen itself is an odorless, nontoxic gas that dissipates easily due to its low densite. However, The use of pure hydrogen as a fuel source in vehicles presents special concerns because of its flammability. Manufacturers of fuel cell vehicles are actively addressing these safety concerns by incorporating technologies such as internal sensors that detect leaks and check valves to prevent the reverse flow or escape of hydrogen during the refueling process.